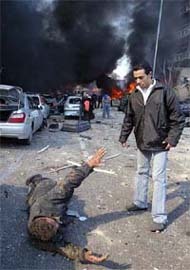 Former Prime Minister Rafik Hariri, who led this country for much of the 15-year period after its civil war ended in 1990 but had recently switched to opposing Syria’s role in the country, was killed in a massive bomb explosion that ravaged his motorcade, the official Lebanese News Agency said today. Consolidating his hold on power, Nepal King Gyanendra today appointed two old-time Palace loyalists Tulsi Giri and Kirtinidhi Bishta as vice-chairmen of the Council of Ministers headed by him. Oxford University has decided to confer an honorary degree of Doctor of Civil Law on Indian Prime Minister Manmohan Singh, a spokesman of the university said today. Dr Manmohan Singh will receive the honour from his alma mater on a date to be mutually agreed. Eleven persons were killed and at least 53 others were injured today in a series of Valentine’s Day bombings by suspected Muslim militants that hit Manila and two southern Philippine cities, officials said. Pakistan will start receiving weapons from the United States under a $1.2- billion arms package by the end of this year, official sources told Dawn. The production of these weapons has already started, they added. Pakistan’s high-profile diplomat and Foreign Secretary Riaz Khokhar, known for his strong views against India, retired today and would be succeeded by the country’s Ambassador to China Riaz Muhammad Khan. Sporadic violence was reported on the first day of the two-day anti-government general strike today even as some 600 suspected Opposition activists were arrested to prevent untoward incident. Sri Lanka's ''Baby 81'', the endearing three-month-old who was found alive in the tsunami debris in a village in the East and was claimed as their own by several couples, today found its biological parents after a positive DNA test. The news agency, quoting a statement from American University Hospital, said Hariri arrived dead at the hospital, his body mutilated in the massive explosion. Hariri’s own Future TV broadcast citations from the Quran. Nine other persons were also killed in the massive blast and 100 wounded, the news agency said. Several of Hariri’s bodyguards were among those hurt or killed, said Lebanese legislator Bassem Yammout who spoke to The Associated Press at the scene. Syria’s President Bashar Assad called the attack “a horrible criminal act”, according to Al-Jazeera television. At least 20 cars were set on fire in a blast that devastated the front of the famous St. George Hotel, blowing off balconies, and damaged a British bank and the Phoenicia Hotel. The Grammys got soul yesterday, honouring Ray Charles with five posthumous awards, including the coveted album and record of the year prizes. Charles' career Grammy haul now stands at 17, tied with bluegrass musician Alison Krauss and Irish rockers U2 at No 8 on the all-time list of Grammy winners. ''He's just made his career about another 50 years longer,'' said Phil Ramone, one of the producers of ''Genius Loves Company,'' which Charles worked on until a few months before his death last June at the age of 73. The album had been a sentimental favourite, especially given the Oscar buzz surrounding Jamie's Foxx's electric turn as the ''genius of soul'' in the movie ''Ray.'' But the Grammys also delivered some big shocks. Leading nominee, rapper Kanye West was snubbed in most categories, including best new artist. That prize went to clean-cut pop band Maroon5, whose stunned members said West deserved the award equally. Grammy organisers, who have taken a lot of heat over the years for some dubious choices, have tightened up selection procedures. But the West oversight, after he released one of the most acclaimed albums of 2004, could prompt renewed criticism of the event's credibility. West, who led the field with 10 nominations, ended up with three awards, including best rap album for ''The College Dropout'' and rap song for ''Jesus Walks.'' U2 and R&B singer Usher also won three each. Singer/songwriter John Mayer also seemed a little abashed to win the song of the year prize, joking that he planned to give the base of his statuette to R&B singer Alicia Keys, who won four Grammys, having also received eight nominations. 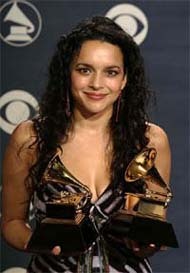 Mayer took home two Grammys, as did jazz pianist Norah Jones, one of Charles' collaborators. Other two-time winners included country veteran Loretta Lynn, funk musician Prince, roots rocker Ben Harper and punk rock trio Green Day, who had received six nominations. Charles was nominated seven times in six categories. The album also won production awards for arrangement, engineering and surround sound, bringing its overall tally to eight out of 10 nominations. Former US President Bill Clinton kept up his unlikely 100 per cent Grammys record by winning his second trophy in as many years at the music industry's annual awards show here. Clinton won in the Spoken Word Album category yesterday for his recording of his best-selling autobiography, "My Life," beating out, among others, comedians Steve Martin and David Sedaris. Eighty-year old Giri, a seasoned politician, was made cabinet chairman by late King Mahendra, father of King Gyanendra in 1961, after dismissing the elected government of B.P. Koirala and banning all political parties in 1960. Giri held this post for four years. He recently returned from Sri Lanka where he has been staying on his own for the past several years. Bishta (79), served as Prime Minister four times and is known as a pro-China politician. Oxford University has decided to confer an honorary degree of Doctor of Civil Law on Indian Prime Minister Manmohan Singh, a spokesman of the university said today. Dr Manmohan Singh will receive the honour from his alma mater on a date to be mutually agreed. Dr Manmohan Singh, who did his higher studies at Cambridge and Oxford, where he completed a D.Phil. in Economics, is among 10 leading international figures due to receive an honorary degree this year. Besides Dr Singh, others selected for the honour include Nobel Prize-winning writer Toni Morrison (Doctor of Letters). "After a career in academia, Dr Singh has held a number of political and economic appointments in India and at international organisations, including Secretary in the Ministry of Finance and Governor of the Reserve Bank of India," the university said. Three persons were killed on the spot and about 20 others were injured when a powerful bomb ripped through a passenger bus in the Makati financial district of Manila in early evening, Metropolitan Manila police chief Avelino Razon said. The package, announced in mid -November, includes eight P-3C Orion surveillance aircraft, six Phalanx close-in weapon systems and an ammunition complement of 2,000 TOW-2A missiles and 14 TOW-2A Fly-to-Buy missiles. The P-3 Orions are valued at $970 million, the Phalanx systems at $155 million and the missiles at $82 million. This is the first major sale of US military hardware to Pakistan since Washington lifted sanctions and named Islamabad a major non-NATO ally last year. Pakistan, however, has not yet succeeded in getting the nod for the big ticket item — the F-16 fighter planes — it has been seeking for long. But there have been recent developments that may boost Pakistan's efforts to get the aircraft. The change at the top in the Foreign Office also saw a minor reshuffle of senior officials, including Foreign Office spokesman Masood Khan, who had been posted as the Permanent Envoy to the United Nations, media reports said. The police and television reports said there were no major incidents despite pro and anti-strikers taking to streets in an apparent show of strength. The shutdown coincided with nationwide rallies of the ruling Bangladesh Nationalist Party against anarchy. Ending an eight-week-long drama, the baby, which was given the nickname by the authorities at Kalmunai Hospital where he was the 81st person to be admitted after the tsunami, was today confirmed as Abilash, the child of Murugupillai Jeyarajah and his wife Jenita.